Have you received your Comms Compliance welcome letter? 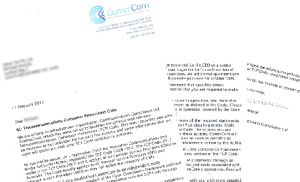 By now, every telco that is subject to the Telecommunications Consumer Protections Code should have received a ‘welcome letter’ from the new Code monitor Communications Compliance Limited. If yours hasn’t yet arrived, TCPCode com.au suggests that you contact Comms Compliance via its new website, without delay. We’ll outline the letter and its contents. 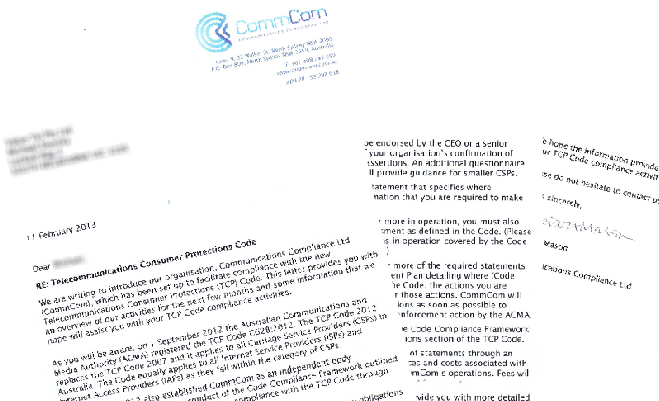 The letter backgrounds readers about the 2012 TCP Code and Communications Compliance’s role under it. There’s a brief overview of the lodgement process for the two (and in the case of large suppliers, three) documents that will have to be lodged by 1 April 2013. It explains when a Compliance Achievement Plan will be required. It gives each telco its access code for the Carriage Service Provider’s area of the website. That’s where you’ll find useful documents and information, and how you’ll lodge your online compliance statements. It already offers a template for the mandatory Customer Information Compliance Statement. It asks you to supply contact details for your nominated Communications Compliance contact person. If you don’t actually supply any services that fall under the Code, it asks you to advise and explain. If you haven’t received your letter, contact Communications Compliance. If you have, and don’t understand what it all means, or your compliance program is way behind the required schedule, contact Cooper Mills Lawyers or visit our TCP Code Compliance Shop. This entry was posted in Communications Compliance Ltd, Compliance Attestation. Bookmark the permalink.